Cloud-based gaming is an idea that’s been tossed around for a little while, but Parsec is hoping to make low-latency, high-quality gaming a reality on almost any device you own. Parsec’s customized software will allow you to connect to your own PC and stream your library of games to almost anything while also allowing you to share your own PC for this purpose with friends and family. It also allows you to build your own “virtual computer” by buying usage hours on a supercomputer owned by either Amazon or Paperspace and thus have a high-end gaming experience without having to own a high-end PC. Is it too good to be true? How does it all come together? Parsec’s CEO Benjy Boxer was kind enough to answer some of my questions on this and more! Q: Whenever I hear bold statements about how someone’s cloud-gaming platform will be able to rival an in-home gaming PC experience, I admittedly become a bit skeptical. What is it that makes Parsec different in this space that would make this promise more able to be fulfilled? Benjy Boxer: At Parsec, we don’t actually believe that our software can rival your in-home gaming experience. However, our goal is to provide casual gamers (those who spend less than 8 hours a week gaming) with the ability to experience PC gaming without having to invest in expensive hardware. You can save substantial money playing this way and depending on your games and perception to lag, not feel much of a difference versus a PC at home. Some gamers may not notice a significant difference when using Parsec, but that depends on your game and distance from the cloud machine. We feel very strongly that we have made the right decisions to deliver the lowest latency possible for streaming games over the internet – we built our own networking protocol to reduce latency further. With that being said, Parsec is not like other cloud gaming companies. We offer a streaming software and platform that can be used on any gaming PC. So if you have your gaming PC at home, you can remotely access it. Perhaps more importantly, you can invite friends to co-play games or watch you play games for virtual hangouts and reliving the old days of couch gaming. Parsec is great for people who have gaming PCs because it gives them the power to do new things like co-play. Q: NVIDIA has been doing something similar with GeForce now for a little bit, but their PC/Mac pricing scheme seems a bit aggressive. Also, they seem to have two distinct platforms, one being for computers and the other for their NVIDIA Shield. Did this inspire your vision with Parsec, making it more universal for users? Benjy Boxer: We were inspired to build Parsec based on this blog post. It gave us the idea that it may actually be possible to stream games with low enough latency if you were to build software specifically for that purpose. We were not seeking to build a cloud gaming product, and we don’t think Parsec is a cloud gaming product like Geforce Now. 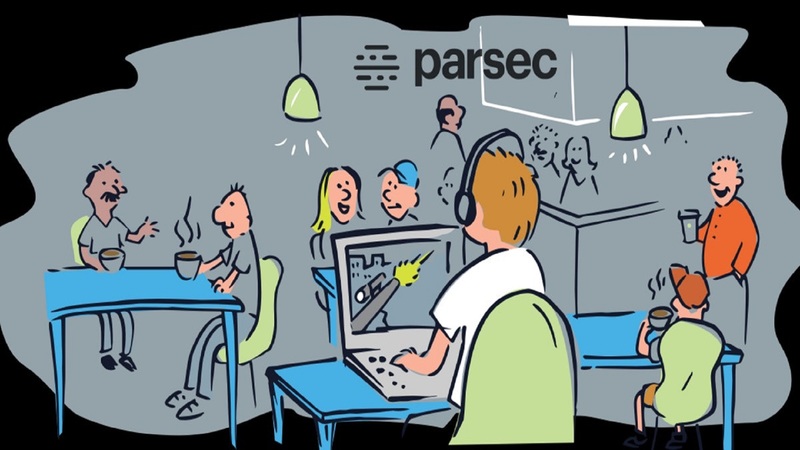 We think of Parsec as a platform for accessing your games and playing games with your friends. Now, if you don’t have a gaming PC, you can rent one from one of our providers (AWS and Paperspace) and then connect to it via Parsec. But you can also connect to your home PC using Parsec or invite friends to connect and play games with you. Q: When it comes to streaming games, even over a local network, input lag is a real concern. You already have whatever input lag exists between your controller/keyboard and your display, and this gets compounded by transmitting over a network. What would the average input lag be playing a game through Parsec and, if you can share this, what is it that keeps it as low as possible? And lag testing with Parsec over the network with details on our testing procedure. From our testing, Parsec does not add more than one frame of lag on top of the lag the game engine already adds when it’s running on the computer. There will also be lag introduced by the ping between two machines. We’ve worked really hard to reduce our latency and have built custom networking code and our own capture, encode, decode, render pipeline. Q: To follow up with the previous question, obviously a little input lag is just fine and most gamers won’t notice it. However, for those competitive gamers playing very fast-paced games, will Parsec be a viable option or will they need to stick to the more traditional, in-home route of gaming? Benjy Boxer: We have lots of people winning games on PUBG, Overwatch, and other shooting games. That being said, I would assume that competitive gamers will never stream from a remote device – every millisecond matters. It’s like many professional musicians will never switch to Spotify because the minute sound differences matter, but for the casual gamer, it’s probably not going to be noticeable, just like the casual listener to music is totally cool with streaming music. Q: There’s no question that, despite what marketing and salespeople would like us to believe, 1080p is still the mainstream video format. However, with more people moving up to 1440p or 4K displays, does Parsec have a long-term plan to eventually supporting 1440p/4K gaming for those with the network to handle it? Benjy Boxer: We already support 1440p at whatever refresh rate you want. We actually support up to 2k. It just takes a lot more bandwidth and can add latency to the encoder, which is why we mostly advertise 1080p. We’ll be able to push 4K when we add support for the h.265 codec. Q: To follow up with question 5, HDR is another thing that some pioneering gamers will care about (or at least games that support a 10-bit color space). Admittedly, only a few do this right now, but I imagine this will continue to change as time goes on. Will Parsec be able to handle rendering with higher color gamuts and HDR’s enhanced contrast? If not at 4K, perhaps at least HDR/wide-color at a scaled down 1080p? Benjy Boxer: This isn’t something that we’re focused on right now. Generally speaking, more data means higher bandwidth requirements and higher strain on encoders and decoders. As the technology becomes viable and available to lots of people, we’ll work on making it possible. But it’s sort of a fight between codecs (h.264, h.265, v10) and bandwidth availability (up and down bandwidth). Q: Personally, I’m someone that has a very high-end rig (i7 7700K, 32GB DDR4 3000, NVME SSD, GTX 1080 Ti), but the prospect of being able to game on any device is still alluring to me. Will there be any enthusiast options for gamers that don’t want to compromise on quality? Benjy Boxer: Well, we really hope that you are able to use Parsec today from home and don’t feel like too much of the quality is lost when you access your gaming rig on another device or outside your home. We can’t claim it will be the same as sitting in front of that rig, but we’re working really hard to make it as close as possible if you have the right networking setup. Also, we hope you find value in inviting a friend watching you play or opting to co-op offline games, like Cuphead, with a friend online. Q: Twitch, YouTube Gaming, and YouTube itself are very popular for Let’s Players and streamers. Obviously, streaming and recording footage at 1080p60 is a pretty demanding task for even a high-end computer; however, people love sharing their gameplay online. Will Parsec have any features to allow this? Benjy Boxer: Actually, a few streamers are doing this already. They get value in being able to play the game on the cloud machine, capture the Parsec window, and push that video directly up to Twitch from their local set up. This reduces tons of strain on the local gaming PC and lets the streamer use the local hardware for streaming and the cloud hardware for gaming. Here’s an example. Q: As a follow-up to that, what about allowing these higher-end CPUs and GPUs to do some video encoding, for those wanting to put videos together for YouTube? Again, that’s a demanding and time-consuming task and one that people might like to offload onto a cloud system, even if they have a high end PC at home (as this would free it up to do other tasks, such as gaming!). Have you considered this? Benjy Boxer: We will support that, and I think some streamers have figured out how to do that already. We’re going to release a video of streaming PUBG from a Raspberry Pi connected to a Parsec gaming rig in AWS. The only thing stopping us right now is that we don’t pass the computer’s camera and pass that data to the cloud machine. You need that to be a full streaming solution without requiring local hardware.